In 2017, we published our 15.4-year results on using VNUS Closure radiofrequency ablation on incompetent truncal veins. The original operations were performed between 1999 and 2001 using the method available at the time, ie, general anesthesia with Esmarch compression bandaging; no tumescence was used. Of 101 truncal veins analyzed, 89 (88%) were ablated successfully and 12 (12%) were ablated partially (partial failure) with reopening of the proximal stump and venous reflux into a proximal varicose vein. There were no complete failures. Despite using first-generation endovenous thermal ablation catheters, very basic intraoperative ultrasound, no tumescence, and without the linear endovenous energy density having been described, these ablation rates are at least as good, if not significantly better than, the ablation rates subsequently reported by those using endovenous thermal ablation. The reasons for these poor ablation rates may be the use of tumescence, poor understanding of the thermal spread from other devices, or rigidity in treatment protocols between different patients with different sized veins. At 15.4 years, 56% (determined subjectively) and 30% (determined objectively) of patients were free from varicose veins. Recurrences were most often due to disease progression, new reflux in veins that were competent at the original operation. There were no cases suggesting that hemodynamic factors were the cause of recurrence in untreated tributary perforators in the groin. We suggest that such “hemodynamic” causes of recurrence are more likely to be biological causes due to neovascularization. I performed the first percutaneous catheter–based EVTA procedure in the UK on March 12, 19996 using the original VNUS Closure catheter (Figure 1). Initially, following the introduction of this technique, there was a lot of skepticism as to what the medium- and long-term success rates might be. Over the years, we have continued to present our results and now we have published our 15-year results from using this original device.7 Despite the considerable changes that have subsequently occurred in the design of EVTA devices and the methods of treatment, these results not only look very good when compared with stripping in the medium to long term,8 but also serve to teach us certain lessons about venous disease and help us understand some of the mechanisms for recurrences after open surgery. 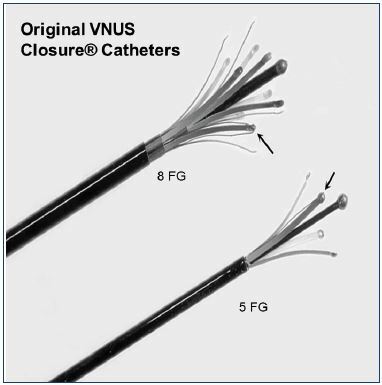 In our practice, we identified 189 patients who had undergone VNUS Closure of at least one symptomatic incompetent venous trunk between 1999 and 2001.7 It must be remembered that, at this time, the radiofrequency ablation technique using the original VNUS Closure device was still very new. Of the 189 patients who we attempted to contact, 5 had died, 54 responded to the invitation, and 4 had reattended by chance for other reasons; in total, we had a study group containing 58 patients (31.5%). All patients were reviewed between June and September 2016, giving a mean follow-up of 15.4 years from the date of the operation. The patient demographics were unremarkable, with the expected preponderance of females (female: male = 43: 15), the mean age at the time of the index procedure was 52.6 years (range, 31 to 69 years), and with the majority of patients presenting with legs classified as C2 according to the clinical, etiological, anatomical, and pathophysiological (CEAP) score. Two veins were excluded from the analysis as they had been treated originally with VNUS Closure and then the patients concerned reported that they had further treatment on these veins, but were unable to give any details. Therefore, our analysis included 101 treated incompetent venous trunks. Of these, 73 presented with primary incompetence and 18 with recurrent incompetence having had previous treatment on the target vein, usually attempted stripping, but sometimes sclerotherapy. The most commonly treated vein was the great saphenous vein, comprising 87 of the 101 veins (86%), the other veins being 2 small saphenous veins (2%), 7 anterior accessory saphenous veins (7%), and 5 Giacomini veins (5%). At follow-up, all patients were initially assessed clinically and an objective assessment of recurrence was noted. Patients were asked if they subjectively thought they had had a recurrence. This assessment was followed by venous duplex ultrasonography by a trained clinical vascular scientist. The technical success or failure of target vein closure was reported using a scale with 4 grades of success or failure (grade 1, complete success; grade 2, partial success; grade 3, partial failure; and grade 4, complete failure) (Figure 2).9 A full venous duplex scan was performed on all of the other veins in the leg to check for any new reflux in previously competent veins. Finally, patients were asked about their satisfaction with the treatment and about whether they would recommend it to friends and family. The results showed that ablation in 89 of the 101 treated veins (88%) resulted in successful treatment of the target vein, with either complete ablation and atrophy (grade 1, 73%) or had minor inconsequential openings with no clinical relevance (grade 2, 16%). None of the veins showed complete reopening (grade 4, 0%), but 12 veins showed partial failure (grade 3, 12%). 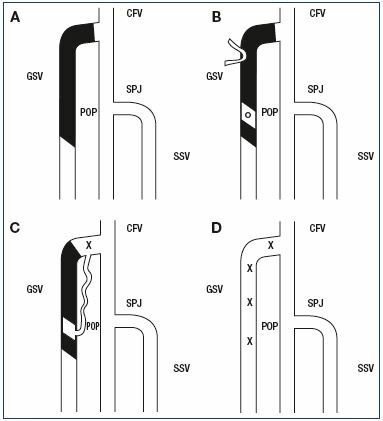 All of these partial failures showed the same pattern of reopening of the proximal great saphenous vein at the saphenofemoral junction with pathological reflux into the anterior accessory saphenous veins. Patient satisfaction was correspondingly high with 58 (100%) saying they were pleased that they had undergone VNUS Closure and 57 (98%) saying that they would recommend the procedure. failure of ablation of the target vein. Panel A. Grade 1: Successful ablation of the whole target vein. where the whole target vein reopened. small saphenous vein; X, venous reflux. Surgery Volume 1. Guildford: Whiteley Publishing; 2017:50-59. © 2017, Whiteley Publishing Ltd, Guildford, UK. However, despite these excellent long-term results with the first-generation EVTA device, patients with varicose veins and venous reflux still have the risk of disease progression. Therefore, it is not surprising that, in a long-term study such as this, it was found that only 56% of patients subjectively thought they were free of varicose veins 15 years after the procedure, whereas the external assessment by the clinical vascular scientist reported that only 30% were objectively free of varicose veins at this stage. Furthermore, venous duplex ultrasonography of the other veins in the legs, apart from the target vein, showed significant reflux in 47 of 91 legs (51.6%) in veins that had been competent at the time of the original procedure. The majority of this new reflux was found in incompetent perforating veins. Although this level of de novo reflux is in line with the expected disease progression in a population of patients known to be at risk of venous disease,10 the pattern of recurrence is worth discussing and is addressed below. Reports of long-term results are always open to the criticism that ”we don’t do it like that anymore.” Certainly, the technique and the equipment used between 1999 and 2001 are markedly different from that used today. I will go through the major differences and point out where any major discrepancies may occur between what we should expect now and what we have reported in this paper. One of the most overlooked differences between our endovenous treatments in 1999 to 2001 and those we perform now is not related to the EVTA device itself, but rather to the ultrasound used to guide the procedure. In the early days of EVTA, we did not have dedicated venous theaters and so the cases reported in this paper were performed in general theaters. There was no routine usage of intraoperative duplex ultrasound for venous cases and so hospitals were not equipped for constant and routine provision of appropriate ultrasound equipment for intraoperative use. Therefore, when we started performing EVTA, although there were relatively good systems available for outpatients for diagnostic purposes, the intraoperative guidance was performed using a very early portable ultrasound with comparatively poor resolution. The equipment used for most of our early cases was the original Sonosite portable ultrasound machine, with a screen measuring approximately 5 cm x 5 cm. The beam width (Z-axis) was very wide, meaning that all cannulation procedures had to be performed using a transverse image. A longitudinal image could often show both the needle and the vein appearing to be in the same place, while in fact they were side-by-side. However, despite this very basic intraoperative duplex ultrasound, the long-term outcomes of ablation turned out to be excellent7 and so a better ultrasound system could only have improved these and not made them worse. In the reported series,7 we used the original technique as recommended at the time by the manufacturers, VNUS Inc, which was general anesthesia with an Esmarch rubber bandage compression to ensure exsanguination of the target vein and good apposition of the vein wall to the device. Tumescence had not been developed and popularized at this stage, meaning that it was not used. Once again, it is clear that this technique worked well in view of the excellent long-term results. Indeed, there are now many series published reporting the results of EVTA using tumescence, showing significant early failure rates.11 The fact that we were able to attain complete ablation in virtually all treated veins, with the only failures being small proximal reopenings, indicates that the thermal destruction of the vein wall is permanent if performed correctly. Hence, such failures cannot be due to thermal ablation itself, but must be due to other factors, such as tumescence, the use of different devices, inconsistencies or poor understanding of the power/thermal energy transfer, or differences in how the procedure is performed, such as patient position or pullback rate. As we have already seen that compression with an Esmarch bandage (rather than tumescence) can result in excellent treatment, it would certainly indicate that such compression is more likely to cause complete exsanguination than tumescence in some hands. Other factors will be discussed below. In 1999–2001, the current trend for recommending that EVTA start a minimum of 2 cm distal to the saphenofemoral junction had not been started; therefore, we had followed the original surgical principles of attempting ”flush ligation,” which we attained in 40% of cases.12 In 1999, we identified 1 patient in whom a thrombus was emerging from the closed great saphenous vein and passing through the saphenofemoral junction, protruding into the common femoral vein. Having never seen this before, we removed this surgically and reported it in 2004,12 6 months before Hingorani drew attention to what he thought was an increased risk of deep vein thrombosis with VNUS Closure19 and Kabnick went on to name this as endovenous heatinduced thrombosis (EHIT) and produce a grading system for EHIT.20 It is interesting that there is a current trend to go back to attempting flush ligation with EVTA techniques now that devices and ultrasonography have improved so much. It is very interesting to see how these results, showing the practical outcome of our understanding of EVTA that we used in our patients in 1999–20017 and published in 2004 and 2006,12,13 compare with the large number of EVTA studies published subsequently using radiofrequency ablation and endovenous laser ablation, where the ablation rates reported are significantly inferior to this long-term study. As suggested previously, these relatively poor results could be due to changing from direct physical compression of the vein onto the device with an Esmarch bandage to a less secure ”compression” with tumescence, with or without the Trendelenburg position. However, it is more likely that these inferior results are due to a combination of factors, including the lack of understanding of how thermal energy is developed and transferred by different devices (as different devices have different methods of producing and distributing their energy), lack of understanding of how different vein and vein wall sizes require different amounts of energy to be given over different time periods, and how both of these factors could inform the optimal technique to be used for any particular device in each individual patient. Therefore, the results reported in this paper could be used as a ”minimum” ablation rate to be expected in the long term for any new EVTA device and technique and could be used as a comparison value. Any series with ablation rates lower than those reported in this study need to be questioned, as these results might indicate a problem with the EVTA device or the technique of how that device is being used. Analysis of the major causes of recurrence in this paper shows that proximal failure of EVTA leading to reflux in the anterior accessory saphenous veins occurred in 12 veins (12% of the treated truncal veins). The major cause of recurrence was de novo reflux or disease progression in veins that had been competent at the original procedure. As outlined above, the rate of this occurring was shown to be in line with the expected rate of disease progression in a similar population from published literature. In addition, 8 legs (17% of the legs showing recurrence) showed recurrence due to previously undiagnosed pelvic vein incompetence, as this was generally not looked for at the time of the original treatment. Neovascularization was only seen in 3 patients; these patients had all been treated for recurrent varicose veins and they had previously undergone open surgery, which were almost definitely the cause of this neovascular tissue. This result would be in line with our previous publication showing that neovascularization does not happen after radiofrequency ablation.23 A further 8 legs (17% of the legs showing recurrence) showed evidence of primary avalvular varicose anomalies,24 a condition that had not been described at the time of the original diagnosis and intervention. What is very interesting is that, in this long-term series of thermal ablation, there is no evidence of any hemodynamic recurrence into groin tributaries that were not closed by radiofrequency ablation. The absence of such recurrence following thermal ablation suggests that such causes of recurrence, which have been widely reported following open surgery at the saphenofemoral junction, are not actually due to hemodynamic factors, but are more likely due to biological factors of regrowth and neovascularization. The report of ablation rates of truncal veins following EVTA with the original bipolar VNUS Closure device confirms the principal of thermal ablation of a truncal vein. It shows that it is possible to completely ablate a truncal vein with thermal energy in the long term. However, considering many subsequent studies have failed to reproduce such good ablation rates even in the short- and medium-term, it has shown that there are potential difficulties in using tumescence with or without the Trendelenburg position and in getting the optimal amount of energy into the vein wall with different devices and techniques over the optimal time period to cause the transmural death. In addition, we have shown that, after EVTA, the most common cause of recurrence is disease progression, and the lack of recurrence due to groin tributaries suggests that hemodynamic factors do not cause recurrence in unclosed tributaries after treatment of the great saphenous vein in the groin. 1. Gloviczki P, Comerota AJ, Dalsing MC, et al. The care of patients with varicose veins and associated chronic venous diseases: clinical practice guidelines of the Society for Vascular Surgery and the American Venous Forum. J Vasc Surg. 2011;53(suppl 5):2S-48S. 2. National Institute of Health and Clinical Excellence. Varicose veins in the legs – guidance and guidelines. 2013. https:// www.nice.org.uk/guidance/cg168. Accessed May 28, 2018. 3. Wittens C, Davies AH, Baekgaard N, et al. Management of chronic venous disease: clinical practice guidelines of the European Society for Vascular Surgery (ESVS). Eur J Vasc Endovasc Surg. 2015;49(6):678-737. 4. Milleret R, Huot L, Nicolini P, et al. Great saphenous vein ablation with steam injection: results of a multicentre study. Eur J Vasc Endovasc Surg. 2013;45(4):391- 396. 5. Yang L, Wang XP, Su WJ, Zhang Y, Wang Y. Randomized clinical trial of endovenous microwave ablation combined with high ligation versus conventional surgery for varicose veins. Eur J Vasc Endovasc Surg. 2013;46(4):473-479. 6. Fraser L. New varicose vein surgery speeds recovery. 19 Nov 2000. https://www.telegraph.co.uk/news/ uknews/1374873/New-varicose-veinsurgery- speeds-recovery.html. Published November 19, 2000. Accessed May 28, 2018. 7. Whiteley MS, Shiangoli I, Dos Santos SJ, Dabbs EB, Fernandez-Hart TJ, Holdstock JM. Fifteen year results of radiofrequency ablation, using VNUS Closure, for the abolition of truncal venous reflux in patients with varicose veins. Eur J Vasc Endovasc Surg. 2017;54(3):357-362. 8. Ostler AE, Holdstock JM, Harrison CC, Price BA, Whiteley MS. Striptract revascularization as a source of recurrent venous reflux following high saphenous tie and stripping: results at 5-8 years after surgery. Phlebology. 2015;30(8):569-572. 9. Taylor D, Whiteley A, Holdstock J, Price B, Whiteley MS. Long term results of thermoablation of the great saphenous vein – outcomes ten years after treatment. In: Whiteley M, Dabbs E, eds. Advances in Phlebology and Venous Surgery Volume 1. 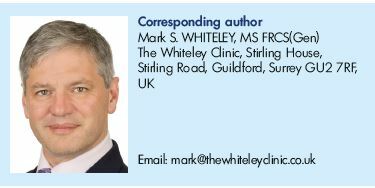 Guildford: Whiteley Publishing. 2017:50-59. 10. Brand FN, Dannenberg AL, Abbott RD, Kannel WB. The epidemiology of varicose veins: the Framingham Study. Am J Prev Med. 1988;4(2):96-101. 11. Balint R, Farics A, Parti K, et al. Which endovenous ablation method does offer a better long-term technical success in the treatment of the incompetent great saphenous vein? Review. Vascular. 2016;24(6):649-657. 12. Whiteley MS, Holdstock J. Percutaneous radiofrequency ablations of varicose veins (VNUS Closure). In: Greenhalgh RM, ed. Vascular and Endovascular Challenges. London, UK: BibaPublishing; 2004:361-381. 13. Whiteley M. New methods of vein ablation. In: Davies AH, Lees T, Lane IF, eds. Venous Disease Simplified. UK: Harley; 2006:113-130. 14. Badham GE, Strong SM, Whiteley MS. An in vitro study to optimise treatment of varicose veins with radiofrequencyinduced thermo therapy. Phlebology. 2015;30(1):17-23. 15. Badham GE, Dos Santos SJ, Whiteley MS. Radiofrequency-induced thermotherapy (RFiTT) in a porcine liver model and ex vivo great saphenous vein. Minim Invasive Ther Allied Technol. 2017;26(4):200-206. 16. Badham GE, Dos Santos SJ, Lloyd LB, Holdstock JM, Whiteley MS. Oneyear results of the use of endovenous radiofrequency ablation utilising an optimised radiofrequency-induced thermotherapy protocol for the treatment of truncal superficial venous reflux. Phlebology. 2018;33(5):298-302. 17. Ashpitel HF, Dabbs EB, Nemchand JL, La Ragione RM, Salguero FJ, Whiteley MS. Histological and immunofluorescent analysis of a large tributary of the great saphenous vein treated with a 1920 nm endovenous laser: preliminary findings. EJVES Short Reports. 2018;39:7-11. 18. Williams KJ, Franklin IJ. Radiofrequency thermal ablation of varicose veins. In: Whiteley M, Dabbs E, eds. Advances in Phlebology and Venous Surgery Volume 1. Guildford: Whiteley Publishing; 2017:25-34. 19. Hingorani AP, Ascher E, Markevich N, et al. Deep venous thrombosis after radiofrequency ablation of greater saphenous vein: a word of caution. J Vasc Surg. 2004;40(3):500-504. 20. Kabnick L, Ombrellino M, Agis H, et al. Endovenous heat induced thrombosis (EHIT) following endovenous vein obliteration: to treat or not to treat? A new thrombotic classification. Third International Vein Congress: In-Office Techniques. April 14-16, 2005. 21. Proebstle TM, Moehler T, Gül D, Herdemann S. Endovenous treatment of the great saphenous vein using a 1,320 nm Nd:YAG laser causes fewer side effects than using a 940 nm diode laser. Dermatol Surg. 2005;31(12):1678-1683. 22. Whiteley MS. Endovenous Thermoablation of varicose veins and examination of the use and failings of linear endovenous energy density (LEED). In: Whiteley M, Dabbs E, eds. Advances in Phlebology and Venous Surgery Volume 1. Guildford: Whiteley Publishing; 2017:11-24. 23. Kianifard B, Holdstock JM, Whiteley MS. Radiofrequency ablation (VNUS closure) does not cause neo-vascularisation at the groin at one year: results of a case controlled study. Surgeon. 2006;4(2):71- 74. 24. Ostler AE, Holdstock JM, Harrison CC, Fernandez-Hart TJ, Whiteley MS. Primary avalvular varicose anomalies are a naturally occurring phenomenon that might be misdiagnosed as neovascular tissue in recurrent varicose veins. J Vasc Surg Venous Lymphat Disord. 2014;2(4):390-396.